Talk about getting a jump on the competition. 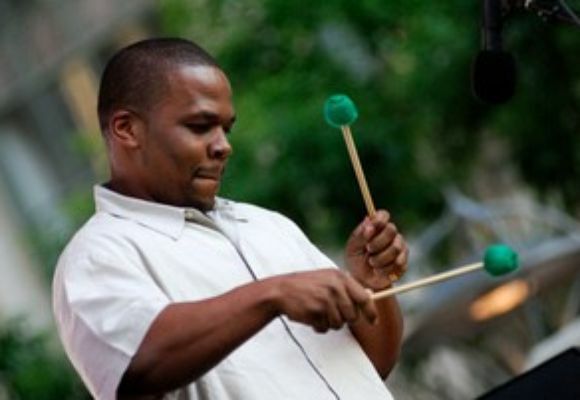 Warren Wolf began playing drums at the age of three, took up vibraphone a few years later, toured with the Baltimore Symphony Orchestra when he was 9, wrote his first tune when he was 10, and was hired for professional jazz gigs by the time he was 12. But he readily admits that when he arrived at Berklee at 17, he still had a lot to learn. Tough talk, but coming from Samuels, whose musical partners have included Pat Metheny, Oscar Peterson, and Spyro Gyra, Wolf took it to heart. He hit the practice room and began a productive eight-semester student-teacher relationship with Samuels. which Wolf wrote for a band led by schoolmate and saxophonist Walter Smith. In addition to displaying his vibraphone virtuosity, the tune--one of about 60 Wolf has written--reveals the composer's desire to veer from approaches often taken by jazz writers. says Wolf. I like grooves. This one is somewhat of a shuffle, but it's like an r&b beat with a jazzy-type flow. I wanted something that would make the drummer open up more. says Wolf. It was like New York. A lot of musicians in the corner with their horns out, ready to play. I just keep meeting people throughout the years. Through either Wally's, Berklee, or other connections, Wolf has played with musicians such as Roy Haynes, Lewis Nash, and Milt Jackson. Through such opportunities, he's been developing a sense of what it takes to be a master. Wolf says, when asked to reflect on his future. A lofty goal for most, but for a musician who had already collected a lifetime of experience at an age when others were just beginners, anything seems possible.